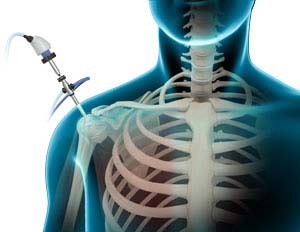 Your surgeon performs shoulder arthroscopy under general or regional anesthesia. You may be positioned lying down on your side with your arm propped up or sitting in a semi-seated position. Sterile fluid is injected into the shoulder joint to expand the surgical area, so your surgeon has a clear view of the damage and room to work. A button-sized hole is made in the shoulder and the arthroscope is inserted. Your surgeon can view images captured by the camera in the arthroscope on a large monitor. Surgical instruments are introduced into the joint through separate small holes to remove and repair the damage to the joint. After surgery, the instruments are removed, and the incisions are closed with stitches or small sterile bandage strips.